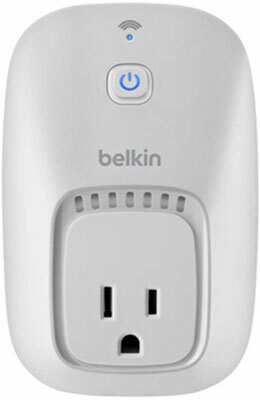 Belkin has come up with an ingenious little device called the WeMo Switch, which is part of the broader WeMo line of home automation products The switch will help you control your non-Internet–friendly devices remotely. Credit: Image courtesy of Belkin. The WeMo Switch plugs into any standard 120-volt outlet. You then can connect any electrical device to the switch and control it from anywhere you have an Internet connection. What a cool idea! From irons to televisions to heaters, you can turn them on or off, and even monitor their usage, using the free WeMo app for iOS or Android devices. If it can plug into an outlet, it can plug into your switch, and as long as your Wi-Fi is up and running, you have full control wherever you happen to be. Plug your switch into any outlet, and then plug the electrical device it will be controlling into it. Download the WeMo app on your smart device. Go to your network settings on your smart device and connect to the WeMo network. 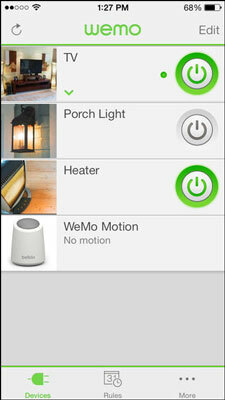 Open the WeMo app on your smart device and select your home’s Wi-Fi network (enter the password, if necessary). This connects your switch to your home’s network. Give your Switch a descriptive name so you know which electrical device it controls in your home (for example, Heater in My Room or Living Room AC), select an icon for the switch to use, and tap Done. Your switch will appear in your list of controlled electrical devices. Tap the power switch button next to your electrical device in the list to turn it on or off. Green indicates the device is on. That’s all there is to it! You can now turn your electric heater or your AC unit on or off remotely without any other devices. Check out the entire lineup of WeMo devices, access WeMo support, and more. WeMo devices can utilize the IFTTT (If This Then That) service to automate tasks with your Switch. IFTTT connects your devices to each other and to other websites to make things work together using “recipes.” For example, you could connect your switch to the IFTTT Weather Channel so that it is alerted when the sun sets, and your switch can automatically turn on a hall light that’s connected to it.